Precocious Brit Florence Welch fired a bullet into the head of the U.K. music scene in 2008 with the single “Kiss with a Fist,” a punk-infused, perfectly juvenile summer anthem that had critics wiping the names Lily Allen, Amy Winehouse, and Kate Nash from their vocabularies and replacing them with Florence and the Machine. 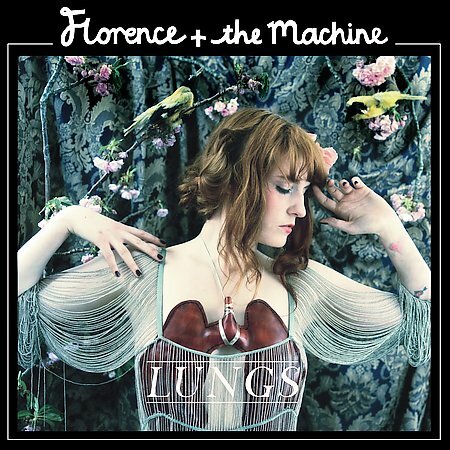 While the comparisons were apt at the time, “Kiss with a Fist” turned out to be a red herring in the wake of the release of LUNGS, one of the most musically mature and emotionally mesmerizing albums of 2009. With an arsenal of weaponry that included the daring musicality of Kate Bush, the fearless delivery of Sinéad O’Connor, and the dark, unhinged vulnerability of Fiona Apple, the London native crafted a debut that not only lived up to the machine-gun spray of buzz that heralded her arrival, but easily surpassed it. Like Kate Bush, Welch has little interest (for the most part) in traditional pop structures, and her songs are at their best when they see something sparkle in the woods and veer off of the main trail in pursuit. “Kiss with a Fist,” as good as it is, pales in comparison to stand-out cuts like “Dog Days Are Over,” “Hurricane Drunk,” “Drumming Song,” “Rabbit Heart (Raise It Up),” and “Cosmic Love,” all of which are anchored to the earth by Welch’s knockout voice (which hopefully in time will lose the occasional Natalie Merchant affectation), a truly impressive and intuitive trio of producers, and a backing band that sounds as intimate with the material as its creator. debut album from mazes and i only stumbled across this by accident while trawling thru myspace . its a nice little album in the folk indie pop genre . i guess it would be nice if you have friends around and you want something easy on the ears that wont impose to much attention . my girlfriend really likes and and a bunch of her friends say its good . so if you wanna give your chic something its a safe bet .